Phoenix Surgicals is a reliable name when it comes to buy the best quality Titanium Implants. 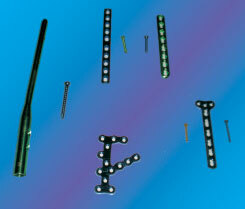 We offer a wide range of Titanium Implants including PFN Nail, Tibia Nail, Femur Nail, Femur Nail GT Entry, DFN Nail etc. These Titanium Implants are specially manufactured using the finest titanium grade 5 material. Widely used for different purposes, these Titanium Implants can also be availed in SS 316 as well. We offer these Titanium Implants in different sizes and specifications, suiting the clientâ��s requirements that too at very affordable prices.